Singer 9960 Quantum Stylist Review – Outstanding Value and Performance! Whether you’re a beginning sewer who is just learning the basics or a professional sewer who wants more sewing challenges, the Singer 9960 Quantum Stylist is the sewing machine for you. This amazing machine is packed with features, but don’t let that discourage you if you are a beginner. 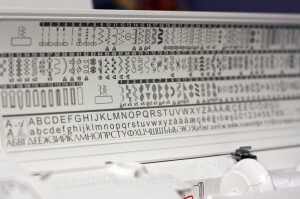 This machine is very user-friendly and convenient for anybody learning how to sew. One of the things I like most about the 9960 is how quickly you can get up and running. With instructions printed on the machine itself, you can easily thread from spool to needle’s eye in just six seconds. If you sew a lot you’ll love this feature as it will be a huge time-saver. Once you are set up you are then ready to choose your stitch pattern. Choosing may be difficult; there are an astonishing 600 available, all of which are located on a chart conveniently located on the machine’s upper lid. You won’t have any bobbin loading issues with this Singer computerized sewing machine. Inserting the bobbin isn’t difficult since it loads right from the machine’s top. You can even monitor your bobbin thread supply through the clear cover. Sewing buttonholes is a one-step process with the Singer Quantum Stylist. You have 13 built-in styles for buttonholes, all perfectly sized and fully automatic. Featuring a buttonhole underplate, a Singer exclusive; with this, you will always have buttonholes sewn in one direction without fabric distortion or stitch gaps. The Digital Advisor Information system is a simple and easy to use LCD screen you use to adjust stitch width settings, stitch lengths, and where you choose from the 600 built-in stitches. It even has recommendations for presser foot selection depending on what choices you make. The Quantum Stylist 9960 computerized sewing machine comes with a removable free arm to provide easy access to collars, pant hems, cuffs, and other areas which are normally difficult to reach. You can create large projects like crafts and quilting on the extension table that provides you with a sewing area that’s extra large with lots of room to work. 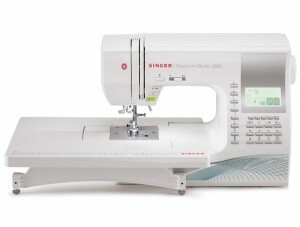 The Singer Quantum Stylist has additional features such as the automatic thread trimmer that electronically trims threads after completion of a project, the stitch editing mechanism that can control a stitch pattern’s look, and, with a touch of the button, enable mirror imaging as well as button elongation. The automatic pilot gives you complete control when it comes to speed. Unplugging the foot control and pressing “start” allows you to slide the level for speed control – from minimum to maximum – to obtain your desired stitch speed when you sew. Up to 1250 stitches per minute. Accessing the most popular stitches – single buttonhole, blind hem, straight, and zigzag, among others is easy with the direct stitch selection button. It is very easy to change the needle’s position. from up to down or down to up, whichever you choose. All done with the press of a button. Change needle positions from any of 25 choices for cording, topstitching or inserting zippers. For free motion monograms, button sewing, and embroidery, you have the drop feed’s box feed motion to ensure perfect feeding all throughout the feed process. This Singer computerized sewing machine has a slow speed option that enables you to sew at slower steady speed for when you need to do more intricate sewing work. You will find the two LED lights an excellent source of illumination, ensuring that your work space is well lit. View stitch functions like stitch length and width, the highly recommended presser foot, and tension settings with the large LCD screen’s back light and brightness control. Push the automatic reverse button if you want to reinforce your stitches by sewing in reverse. And with the 9960’s automatic lock system, you can easily tie-off utility and decorative stitches with just one button push without worry of your stitches unravelling. The Singer Quantum Stylist has an automatic bobbin winder with a needle bar that disengages while the bobbin winds, a safe procedure to ensure that no needle will move up, down or sideways. It stops turning automatically when the bobbin has been filled so there’s no worry at any time of overfilling the bobbin ever again. Create attractive decorative and satin stitches with a pre-set maximum width of 7mm width without thread breakage or poor formation of stitches with its horizontal threading feed. Use the auxiliary spool pin if you desire vertical threading. If you are sewing incorrectly, the 9960 will alert you with an audible warning, albeit this could be deactivated if you wish to do so. And if you think that is awesome, a warning animation will appear on your machine’s LCD screen and display what may be causing the probable error. You will always have a consistent quality of stitch no matter what fabric type that you work on with the automatic tension adjustment. The second of two heights in the presser foot lifter provides you with more clearance that is typically required when working on multiple bulky fabrics, like a quilt, under the presser foot. This model will be with you, and your family, for a long time because of its heavy duty construction. The durable metal frame holds all of the machine’s mechanisms in place and well-aligned. This provides sewing that is skip-free all throughout and overall durability as well. The Singer 9960’s control system provides additional power to maintain the kind of speed you need when working with thick fabrics or when they change conditions, a much-appreciated features when you sew through six, seven or eight layers of the thickest of fabrics such as corduroy or burlap. With a 25-year (limited) warranty, inclusive a year on machine adjustments and five years on its electronic components, what more could you ask for in a sewing machine? Competitor sewing machines will be hard put to match these features! There is a lot to love about the Singer Quantum Stylist. Packed with easy-to-use features this machine is a beginner’s dream. If you do your research and base a purchasing decisions partly on customer reviews, buying this Singer sewing machine will not be difficult. For the price the Singer Quantum 9960 is very hard to beat. This is one machine that is certain to satisfy sewers of all skill levels. Click here to see pricing information and availability on Amazon. 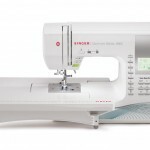 The Singer 9960 is a great all-round sewing machine that is perfect if you want to do a variety of sewing projects. If you are interested in making quilts, the 9960 is great for that as well. However, if all you are making is quilts I recommend that you read our quilting machine reviews here. I received this machine as a Christmas gift, and the bobbin jammed after one day. Later, I found postings that the bobbin jams but Singer has fixed the problem. I’ve been to three sewing stores since returning my machine. Every single store owner told me this is a machine that is being returned by the THOUSANDS. One repair person said the insides are not properly tightened at the factory- and after people come in with it and he tunes it , it runs much better. I’m sorry you are having trouble with your 9960. I called my sewing machine provider and they too said the same thing. He mentioned that his new shipment is performing much better so hopefully Singer has solved the issue. Thanks for bringing this to my attention. It isn’t super quiet, but I’ve definitely heard louder. I never had an issue at high speeds with this machine when I was testing it and many people of purchased this machine since I wrote this review and I haven’t heard any bad comments yet. I have had quite a few positive ones though. I hope that helps. I’d love to know when you wrote this and when the comments were made. I’m seriously considering this machine, I’d like to make sure I don’t purchase a lemon. I originally wrote this in late 2014, but have updated the review since then. I still really love this machine. It is a good overall choice for its price and has tons of features and does everything really well. I’m contemplating getting this machine. Is it still a good machine after using it for four years? Any issues or problems?